A whole day to wander around Athens, on the prowl for interesting food, books and records. One of the biggest advantages of touring by automobile is that you can buy as many damn books as you want without worrying about how you're going to get them all on the plane. I found a good used book store and went nuts. Athens is a lovely little town. Perhaps it was my imagination, but I thought I could detect a lingering atmosphere of relief that the 80s hipness spotlight, in sharp focus when REM was in its prime and Athens was ballyhooed as the most important breeding ground for new music, had moved elsewhere--to Seattle, or Austin, or wherever. Life in Athens flows on at a relaxed pace. Bent on sampling regional cuisine and foiled in my efforts to pry the secret locations of good barbecue spots from the locals I engaged in conversation ("Moved out of town." "Closed on Mondays." "You have to go to South Carolina." "No good since they changed owners. 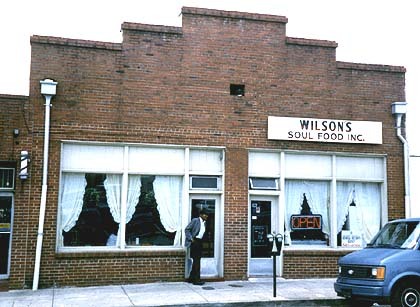 "), I stumbled onto Wilson's Soul Food Restaurant and decided to postpone the BBQ quest. It was good, solid, home-cooked food, served in a calm and friendly atmosphere. I still can't sing like Percy Sledge though.